I’m going to be completely straight with you here, my skin gives me more trouble now at 36 than it did at 16. I have to wash my face religiously twice a day or will break out. I stick to very gentle face cleansers. It’s so dry here and harsh cleansers will make my skin peel and that’s the opposite of cute. Also the opposite of cute? Wrinkles. Don’t get me wrong, there is nothing wrong with them; it’s part of life. I just don’t really want that part of life hurtling at me quite so quickly. A few months ago, I was getting my hair cut and while I was there, my stylist and her friend told me all about their recent foray into injectables. Like the kind of injectables you would get into your face. They mentioned to me that when they were at their consultation, the doctor told them that “most women of a certain age are either a one or an eleven”. I was all, “Well, that’s pretty rude” and then they explained to me that he was referring to the lines between your eyebrows. Here’s the deal. I never gave a thought to the lines between my eyes, I was much too worried about crow’s feet. And the lines around my mouth. Plus there is NO way I’m letting anyone inject anything into my face. And that’s why I jumped at the chance to try StriVectin-SD™ Intensive Concentrate for Stretch Marks & Wrinkles. I don’t have stretch marks, but I am a one, y’all. StriVectin is the leading clinical anti-aging brand that rebuilds skin health over time. They have 30 patents based on 25 years of biological research. Only StriVectin formulas have a patented, clinically-proven NIA-114 molecule that powers up skin to help repair damage and fight off all visible signs of aging, you can read all about skin science on the StriVectin website. 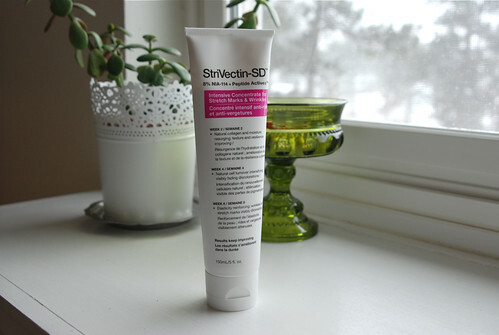 Twice a day after cleansing my face, I apply the StriVectin. Actually directions state to apply it to wrinkle prone areas, so I put it all over my entire face, I’m not taking any chances. I am on the fourth week of using the product and by god, it’s working. I feel like the lines on my face are become lighter and my skin is looking refreshed. StriVectin-SD™ Intensive Concentrate for Stretch Marks & Wrinkles states that around Week 2 my natural collagen and moisture should be resurging and around week 4 my natural cell turnover will intensify. BRING IT. Wanna chance to win a $100 Visa gift card? Leave a comment and tell me: What interests you most about NIA-114, a key active ingredient in StriVectin-SD™ Intensive Concentrate for Stretch Marks & Wrinkles? The Official Rules are available here. This sweepstakes runs from 2/25/13-3/24/13. And then that dream comes true thanks to West Elm being a believer in magic. 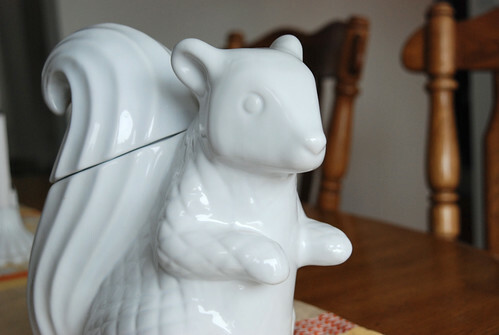 A squirrel cookie jar. I mean, seriously. Now, I only knew about this bit of magic because I have received approximately 82 messages with a link to the said cookie jar, so good looking out to everyone who had my back. 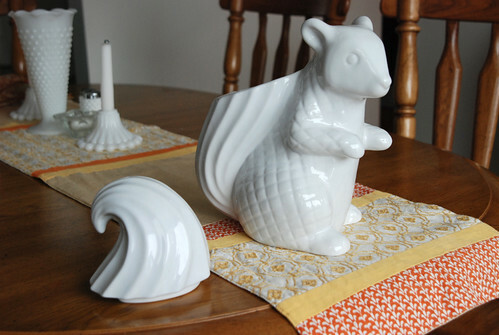 While I did appreciate the head’s up, I didn’t immediately buy it because we used to have a cookie jar and then the kids managed to break it into a gazillion million pieces all over the kitchen floor. I heard the crash while I was upstairs and I knew it wasn’t good. However after the crash no one cried or screamed and this is how I knew they had really effed up something I own, their silence is telling. I ran downstairs and was met with Troy sitting on the kitchen counter, Zoe holding the bottom of cookie jar, and the lid smashed all over the floor. 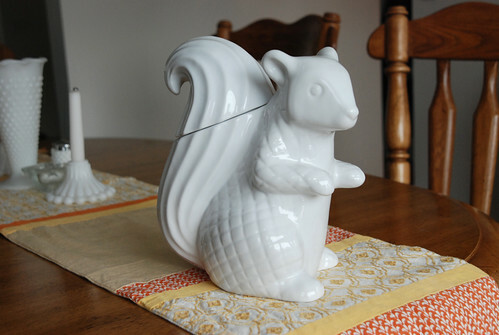 I didn’t buy the squirrel cookie jar for myself because I don’t want it to get broken. And that’s such jacked up logic that I can’t even believe I just admitted it to you. Attention family: we will not be storing cookies in my baby precious, so please refrain from touching the jar and/or looking in his tail for any sort of sweet treats.